This inexpensive table top machine has proved to be a valuable asset to many bakers and caterers, as it will slice not only round rolls, but finger rolls, doughnuts and eclairs. 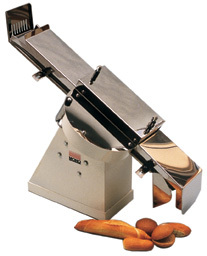 The Mono Roll Slicer is easy to operate and by a simple adjustment the position and depth of slice are variable. It is fitted with a circular high tensile steel blade, ensuring years of trouble free service. Finish: White stove enamel body and stainless steel guides.